This book is a compilation of past articles, sections from other books Shane Idleman has written, and sermons preached at Westside Christian Fellowship—the best-of-the-best. We pray that this collection of targeted topics fuels an intense desire for more of God. Though the road ahead may be uncertain at times, the solid ground beneath will never shift. It’s all about Who you know.Desperate for More should be the heart cry of every believer. Regaining Lost Ground Episode Reminder Get a sneak-peek into each new show, delivered straight to your inbox! Today, as we continually drift away in a current of moral decline and relativism, many believe that the battle is too advanced and that we cannot make a difference. Shane, however, believes that we can. He stresses: "If we encourage truth, yet fail to relate to our culture, the church can seem formal and dead. This fact fuels the postmodern movement. But when truth is sacrificed for the sake of relating to the culture, as we see today, the very foundation is destroyed. Truth, the foundational beliefs clearly outlined in Scripture, must remain unmoved and unchanged. Times change, but truth does not! 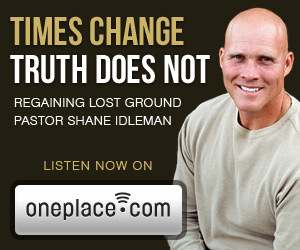 Author/speaker, Shane Idleman, has written six compelling, biblically-based books, and has obtained quotes from such noted pastors and leaders as Jack Hayford, D. James Kennedy, Tony Perkins, David Barton, Mike MacIntosh, Dr. Peter Lillback, Bob Coy, and Raul Ries, and from organizations such as the National Academy of Sports Medicine, Promise Keepers, American Family Association, and Family Research Council. What makes this story so inspiring is that Idleman had a promising career as a Corporate Executive, but he left it behind to follow a dream that God placed in his heart after he committed his life to Christ. In his words: "While I had focused on prosperity, wealth, and success, I had starved my soul. I tried everything that the world had to offer, but ultimately, I found that it offered little of lasting value." When asked why he thought that his ministry is being so well received, he added: "The overwhelming response simply reflects the need that we all have for the truths found in God’s Word." Shane is known for crossing denominational lines. He adds, "We must strive for unity in the essentials, and grace in the non-essentials. We need sound doctrine and the power of the Holy Spirit. It’s possible to be Bible taught, but not Spirit led—straight as a gun barrel theologically, but just as empty. The letter kills, but the Spirit gives life. We desperately need both" (cf. 2 Corinthians 3:6). Idleman is the founder and lead pastor of Westside Christian Fellowship, in Lancaster, Ca. His sermons, books, articles, and radio program have sparked change in the lives of many. For more, visit WCFAV.org, or ShaneIdleman.com.